Ever have one of those days where everything goes wrong. No matter what you did you just couldn’t get ahead. Well if you are building a home business chances are you have more than your fair share of these types of days. These days are filled with frustration, confusion and discouragement. How do you persevere during these trying times? How do you keep a positive attitude? If everything is not working in your favor it is a natural reaction to feel like world is against you. You could start to play the blame game and start feeling sorry for yourself. But does that really get you anywhere? You know the answer. If your doing personal development activities each and everyday then you become more prepared to handle days of discouragement. It doesn’t mean that you won’t feel bad but you will have the mindset to recharge your batteries to keep pushing forward. And that’s what this business is all about. Working twice as hard on yourself in order to be a success in your business is what separates you from amateurs. The song comes to mind, “Momma said that there’ll be days like this.” LOL And it is true that it is VERY easy to get down on yourself especially when you are just starting out. You know what I do when I get frustrated and disappointed. I take a break for myself. I go out for a walk, go to the gym, clean the kitchen, go grocery shopping, or whatever it is that I need to do that day. Then once I calm down and realize that life really isn’t that bad and remember all the things that I do have I get my head back into the game and jump on my A game again. That post is what we all go through. Everyone has this need for instant gratification. It’s funny, I have met with mega successful business owners and they all say the same thing, there is NO magic bullet. The faster you fail the faster you will become rediculously successful. Personally I have found that listening to people that have what I want, reading, listening to modivational audio and taking Massive action allows me to stay grounded. A lot of the top leaders say that 80% of network marketing is personal development. When a lot of people first get into the business,they don’t understand what it has to do with the industry, but once they go through some “negative” experiences then the reason why those leaders said this tends to manifest in itself. Personal development helps to develop mental toughness and also learning how to handle different situations. Thanks for sharing this valuable, motivational post Yvar. 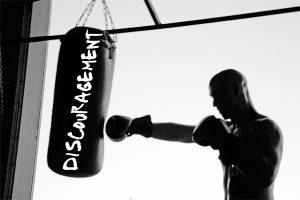 Yes everybody gets discouraged! It’s only human, if you want success you have to accept failure. One cannot exist without the other. Together we will be tough enough to reach the top!